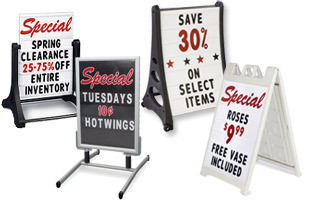 Display Boards in Many Sizes & Styles! There are great presentation boards for science projects. Students can adhere their data results, presentations, and graphics to these display boards for trade show. 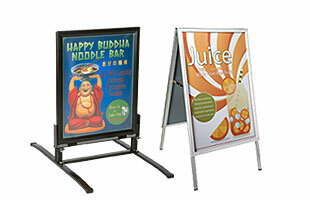 Display boards can be used for a variety of applications and functions. 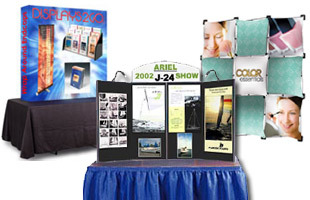 Presentation display boards are useful in almost any location, like trade shows, conventions, schools, hotels, or restaurants. Many products across several different product lines can be considered display boards for science projects. Covered in hook & loop-receptive fabric, folding display boards offer an easy, versatile way to get a customized look at a low cost. Just attach any number of accessories and reconfigure when necessary. These presentation essentials can make your science projects unique and interesting. Display boards can also refer to notice and information boards, dry erase and marker boards, or letter boards. 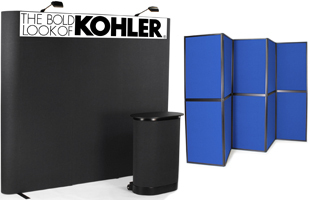 These products are perfect for school classrooms, restaurants, hotels, and business offices. 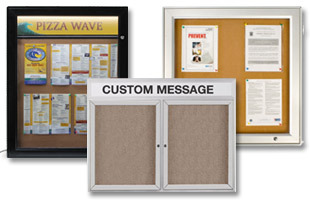 Bulletin display boards, such as pin boards and fabric boards, offer a functional surface that allows you to tack and post memos, schedules, ideas and other useful information. 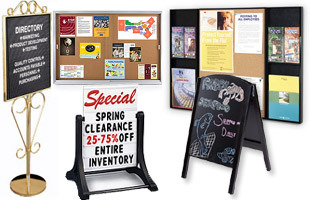 We offer a wide assortment of different bulletin boards, including enclosed message boards, waterproof display boards, floor standing models, or combination style boards for increased versatility. In addition to bulletin boards, we also offer many marker and dry erase boards that make great additions to school classrooms and coaches offices'. These information boards are easy to use, clean and many even come with markers. Letter boards are also great display boards for hotels, malls, and other lobbies as directories. Our letter boards come in a variety of styles that are great for displaying your information, advertisements, messages, and announcements. Slatwall boards for information and directions are also great indoors in retail and grocery stores. 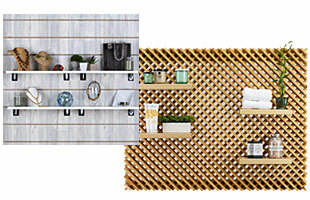 These wall mounted displays are designed to hold a variety of interchangeable accessories. In addition to the products shown here, we also offer many displays that are designed for sidewalks and pavement. These sandwich boards are great just outside of restaurants, ice cream shops, and more. Outdoor signs like these menu board products are a perfect way to greet customers at your storefront to present daily or weekly specials. We provide all of these products at the lowest price and in the fastest delivery time possible. We have thousands of different POP displays, trade show supplies, and retail fixtures that are available for purchase through our extensive online catalog. Browse our main shopping page to view our complete product selection and place your order using our secure online checkout. As a leader in this industry, we have been manufacturing and packaging proprietary fixtures, marketing displays and other related merchandise since 1974. Ninety percent of our products are inventoried "in stock" and are ready for same day purchase and shipping. Start your shopping today.